This ruby wedding cake was done in an almond, chocolate & marmalade tarte. I turned it upside down for a smooth surface. I then covered it with marzipan and layered it with icing paste. The flowers were done free hand without any cutters. Very nice! Also pretty and very good job on the flowers! Join in and write your own page! It's easy to do. How? 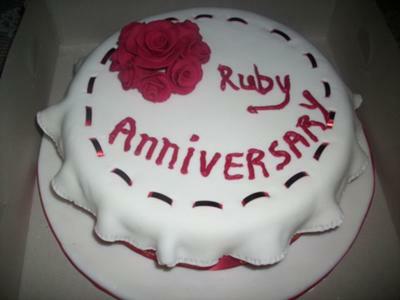 Simply click here to return to Wedding Cakes, Bridal Shower Cakes and Anniversary Cakes.